$5,000 in Prize Values! Enter to win! Take a chance to support the BEF. 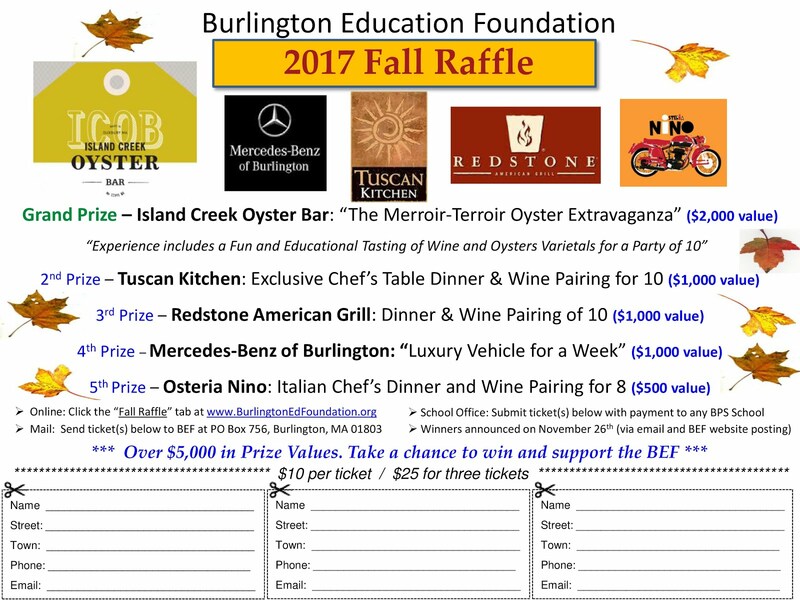 "Experience includes a Fun and Educational Tasting of Wine and Oyster Varietals for a Party of 10"
Enter to Win Fall - Grand Raffle! Your raffle donation will help fund grant requests for creative and innovative curriculum enrichment programs. Winners to be announced Thanksgiving weekend on November 26, 2017 via email and posted on this webpage. Don't forget that the BEF will be holding their 14th Annual “Exercise for Education” 5K Road Race and ½ Mile Family Fun Run at Burlington High School on Sunday May 6, 2018.